To view 7 more pictures, interactive maps and the full, detailed description of the Sommerton (55+) community, please Login. A new construction townhouse in Sommerton can be a cure-all for what ails today’s homebuyer. Homes for sale in this development give residents of 55 and older security, value and comfort. 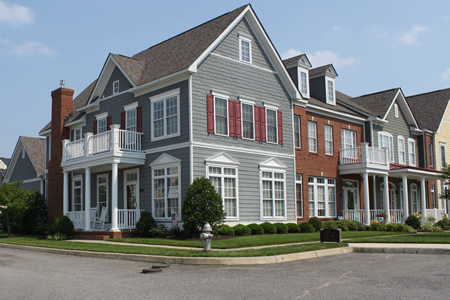 Located near the bustling Greenbrier section of Chesapeake, VA, these homes offer convenience. Veterans won’t have too far to drive when accessing facilities on military bases like NAS Oceana, Naval Medical Center Portsmouth and the Coast Guard Finance Center. Take a gander at the outside of the new construction houses and instantly see a difference. Homes for sale in Sommerton make homebuyers want to see more. Each townhouse here may include two-car garage with remote(s), rich exterior color scheme, 30-year architectural shingles, vented attic, custom exterior lighting, professional landscaping and more. Residents also have use of an on-site elevator. Come in, take off those shoes and stay for a while in this townhouse. Each of these homes for sale is generously appointed with both traditional and modern touches. Each new construction home in Sommerton may come with 10-foot ceilings downstairs, Schlage door hardware in nickel finish, crown molding, hardwood flooring, ceiling fans with lights, custom Kraftmaid cabinetry, Kohler cast iron sink, Frigidaire stainless steel appliances, granite countertops, garden tub, elongated toilets, Trane dual-zone heating and cooling system and more. This is one exciting city in Virginia. People come from all over the Hampton Roads area for the shopping, dining and entertainment found in the Greenbrier area. Golfing enthusiasts can play some challenging rounds of golf at the Greenbrier Country Club. Take the whole gang over to Chesapeake City Park where they even have a special place just for the dogs. Homes for sale in this new construction development look like something right out of an interior decorating magazine. Isn’t it time you lived in something worthy of your presence? Choose a townhouse in Sommerton and choose a better way of life. Send me more information about the Sommerton (55+) new home community. Our agents gladly offer FREE property tours of Sommerton (55+), Chesapeake and homebuyer consultations to all serious buyers.